This is a quick tutorial on how to make a tassel. 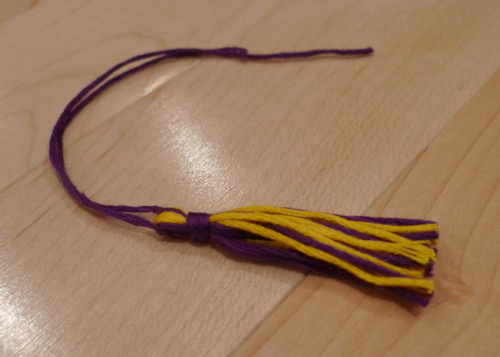 This tassel was used to attach to the mortarboard of a Graduation Teddy I made, but you can use tassels as a finishing feature to decorate other items as well, such as carpets and drapes. 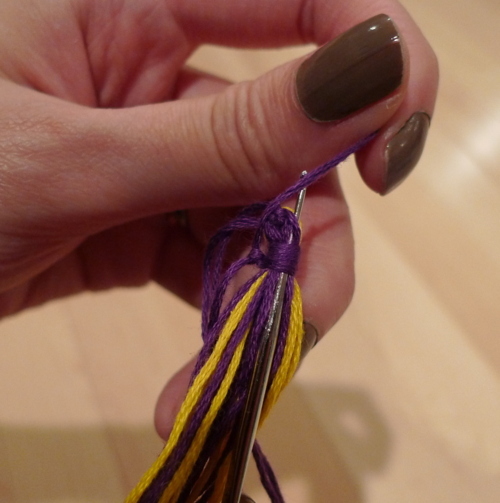 Choose what colours you would like your tassel to be comprised of using embroidery floss or yarn. 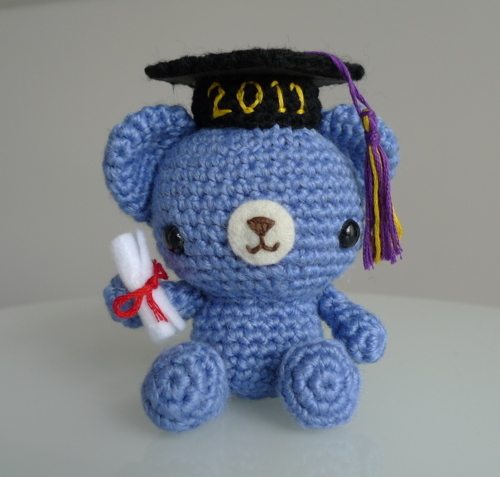 If you are making this tassel for a graduation teddy, I recommend using the school colours of your graduate. 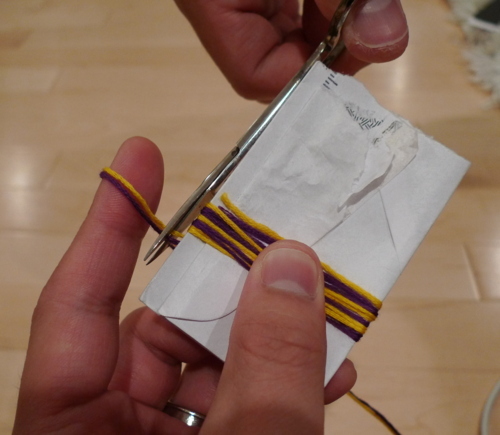 Get a piece of paper of an appropriate size (or fold the paper) and begin wrapping the embroidery floss around the paper. Cut the ends after you’ve finished wrapping the embroidery floss to your desired thickness. 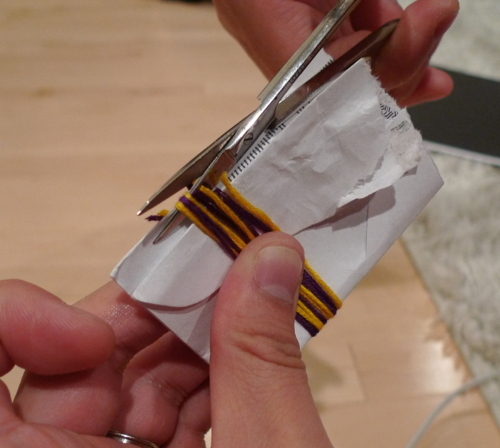 Holding the embroidery floss on both sides firmly, cut the floss in half along the edge of the paper. Choose what colour you want the knot of the tassel to be (as well as the string that will attach to the centre circle of the mortarboard). Cut a piece of embroidery floss using that colour and tie a double knot firmly in the centre of the strings (where they were folded). 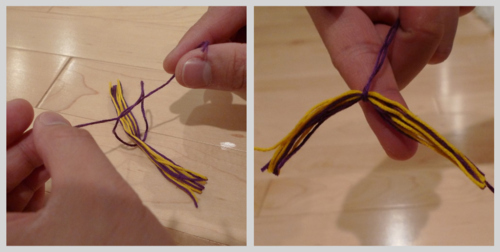 Fold the yellow and purple embroidery floss back upon themselves in half. Keep the purple embroidery floss (the one just used to tie the double knot) separate and out of the way (if you have an extra pair of hands, have that person hold this piece taut away from you). 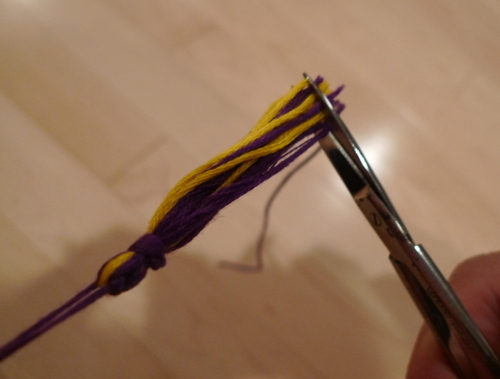 Use another piece of embroidery floss (same colour of floss used to tie double knot) and wrap it multiple times around the rest of the floss that is folded in half. When desired thickness is reached, tie a double knot. Using crochet hook, pull ends of floss down and through the wrapped portion to hide them and have them blend in with rest of embroidery floss. Pull only the ends of the most recent double knot (used for wrapping) and NOT the original double knot that was kept separate (these ends will be used for attaching the tassel). Trim ends using sharp pair of scissors. 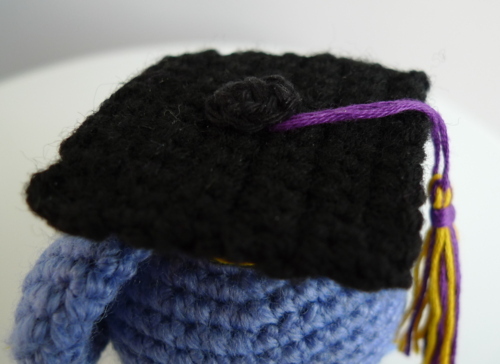 If making tassel for Graduation Teddy, attach tassel to mortarboard by wrapping ends around centre circle. The tassel adds a nice touch! If you would like to watch a video on how to make a tassel, click here (this is the one I used to make this tutorial). As I was looking up graduation quotes, I came across this witty one: “The tassel is worth the hassle!” Of course, this tassel in particular is quick to make and not a hassle at all 🙂 Give it a try to add a nice decorative touch to your projects!